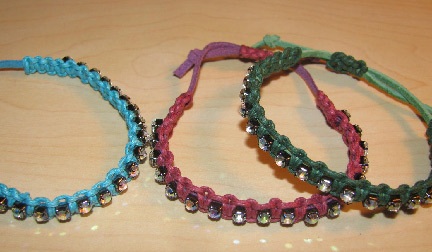 Remember how just before my vacation, I showed you some Shamballa bracelets I made with cording, ribbons, and cup chain? Well, here are a few more, just to show you some that are slightly more traditional. 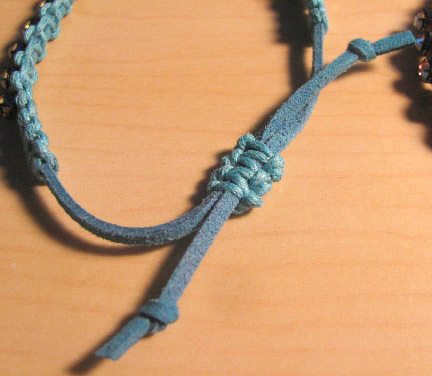 I made these with the same type of 3mm cording, but only one strand of it, cut to a little over 12 inches. Likewise, I sized down the cup chain slightly to between 3 and 4 mm, and I only needed about 60 inches of colored macrame cord to knot each one. Follow the same directions as for the tutorial linked above, with the substitutions I've listed, and knot your little heart out. I made all three of these in one afternoon! TOTALLY love these, Cyndi. I think they'd be great alone or grouped together. So so so much fun to wear, Cherie!